Bitumen Emulsion Plant 06F Type As one type of asphalt emulsifying equipment, this bitumen emulsion plant GYRY06F is not equipped with a heating system. The plant is suitable for producing emulsified asphalt with various specifications to meet the requirements regarding different construction technologies.For convenience of delivery, a modular design is adopted and all components are fixed on one base frame. 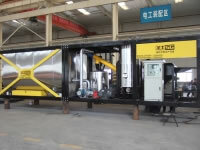 Bitumen Emulsion Plant 06F Type Equipped with a heating system, the bitumen emulsion plant GYRY06H is suitable for producing emulsified asphalt with various specifications to meet the requirements regarding different construction technology.For convenience of delivery and operation outdoors, all parts are designed to be easily disassembled and all parts are fixed on one base frame when in use. 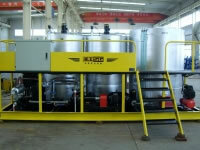 Bitumen Emulsion Plant 10 Type With a simple structure and capacity of 10t/h, the bitumen emulsion plant GYRY10B is used to produce a wider range of emulsified asphalt types.The flow ratio is controlled by electrically adjustable valve. 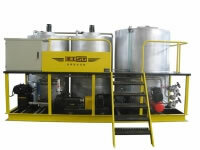 As a result, the bitumen emulsion plant GYRY10B is suitable for continuous operation, resulting in reduced operating costs. Rubberized Bitumen Emulsion Plant 15 Type Adopting McDonald technology, the asphalt rubber blending plant is used to produce rubber asphalt. With this technology, the stone matrix asphalt is heated quickly to 218℃ in the heating device. Then the stone matrix asphalt enters into the continuous blending shearing device and mixes with room temperature rubber.Then the blended rubber asphalt is put into the reaction kettle with high temperature of 190℃~218℃. 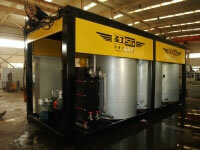 Rubberized Bitumen Emulsion Plant 06 Type With a capacity of 10-40 tons/h, the asphalt rubber blending system is specialized equipment for producing rubber asphalt. The horizontal reaction kettle is equipped with a spiral mixer to effectively prevent the separation of rubber and asphalt.Batching system is composed of hopper, beater, mixer and gauging device. Gaoyuan is specialized in manufacturing road maintenance equipment and with applications for chip seal, slurry seal, micro surfacing, asphalt distribution and pavement pothole repair. 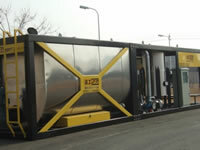 Above shown are the asphalt and bitumen emulsion production equipment, that can be used for blending asphalt and rubber by using the recycled tyre for making asphalt. We are specialized in providing a comprehensive line of road machinery, with over 15 years of experience, nowadays Gaoyuan provides road maintenance equipment and solutions for customers.